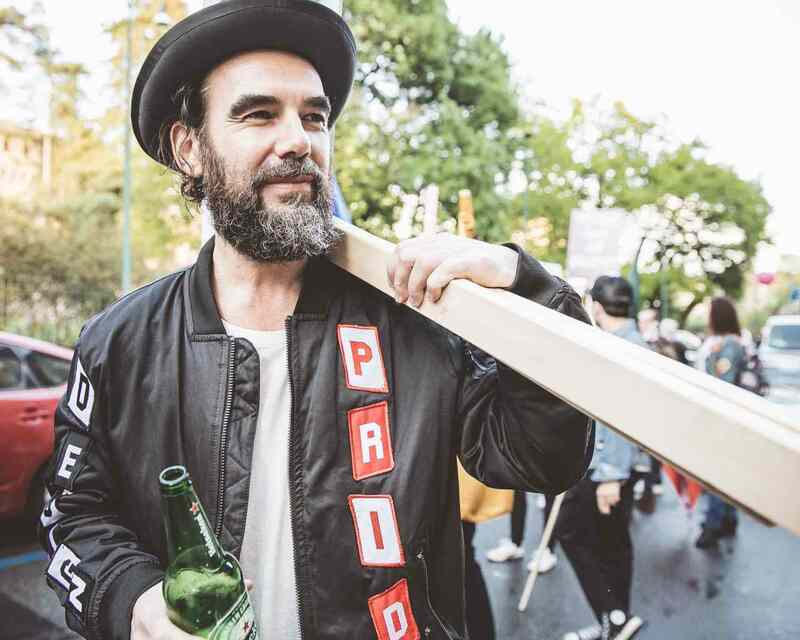 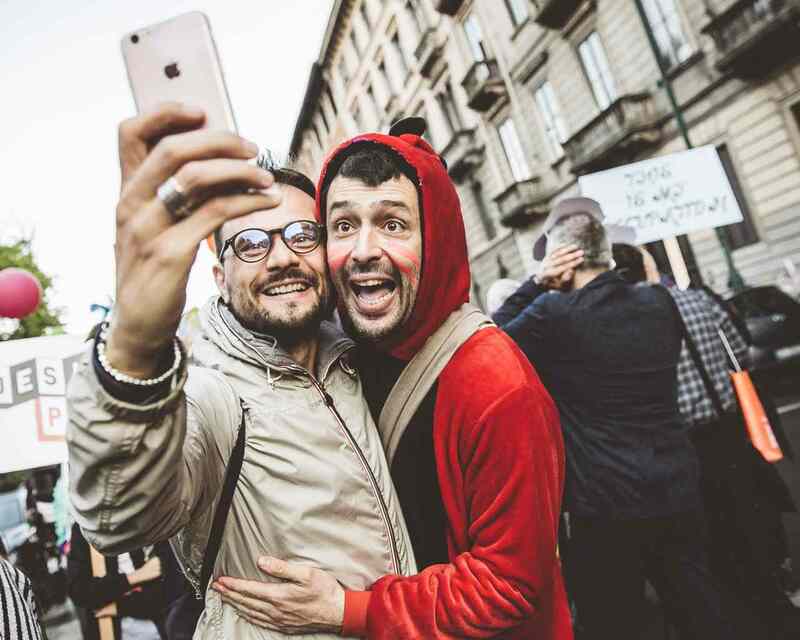 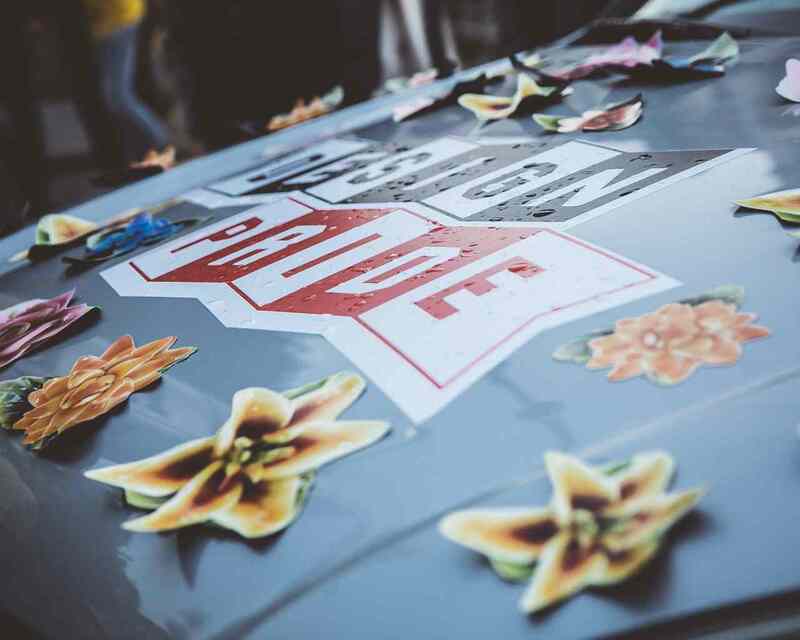 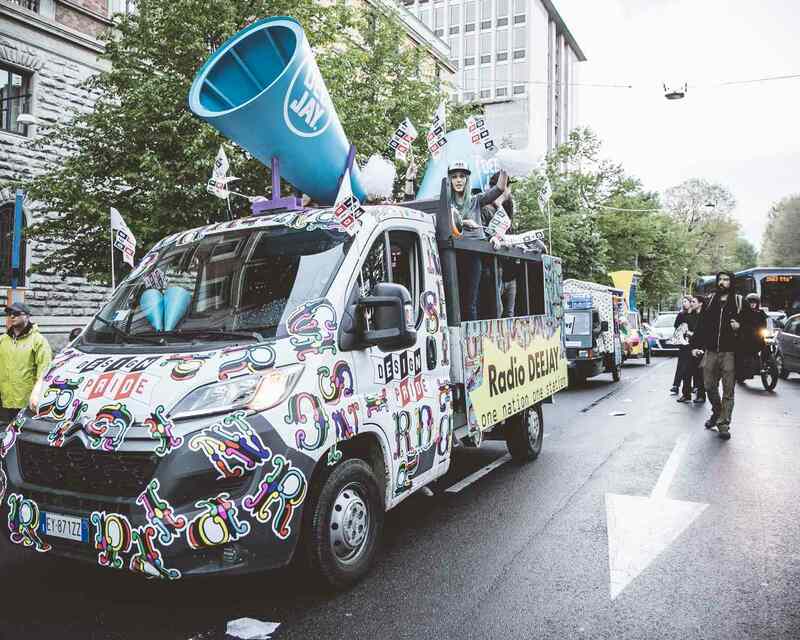 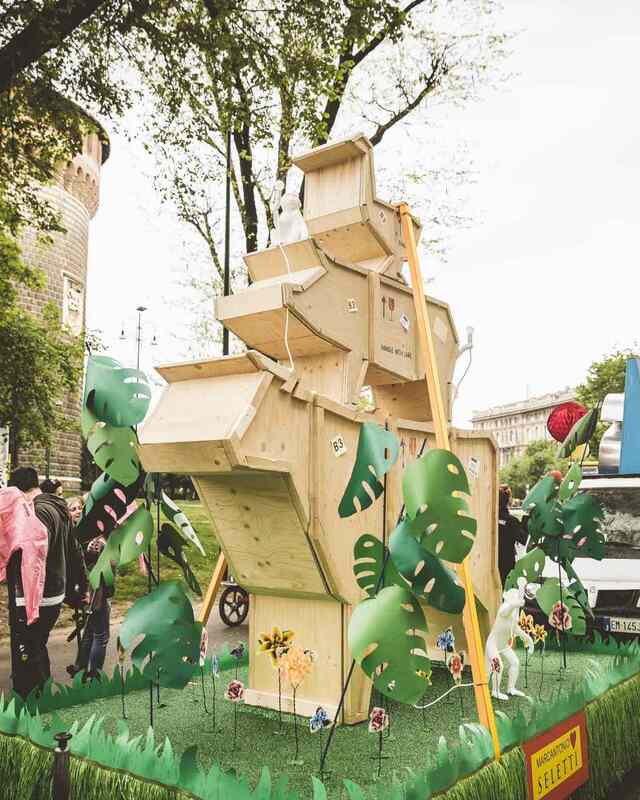 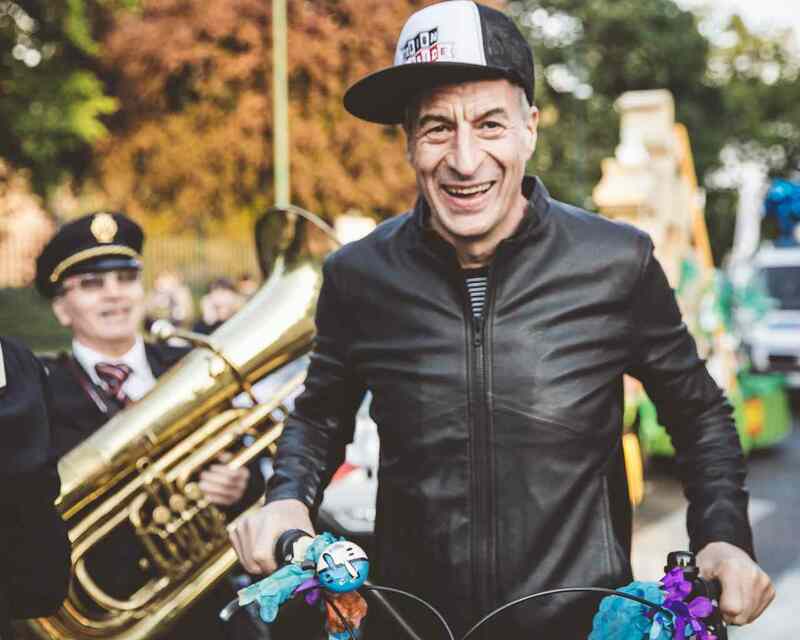 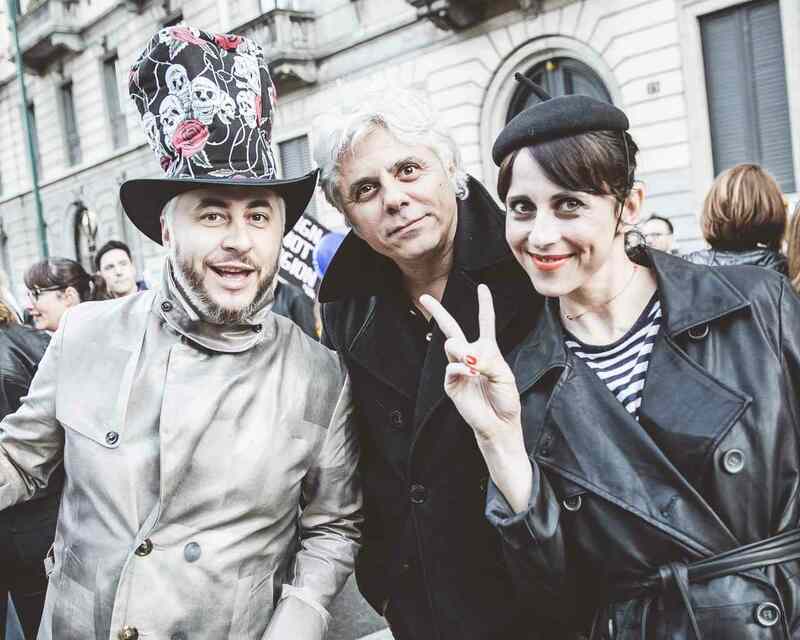 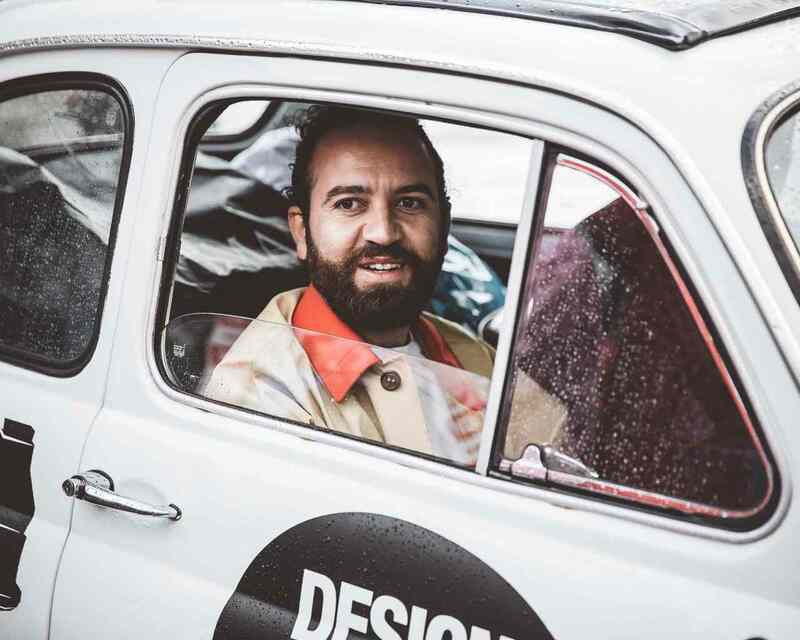 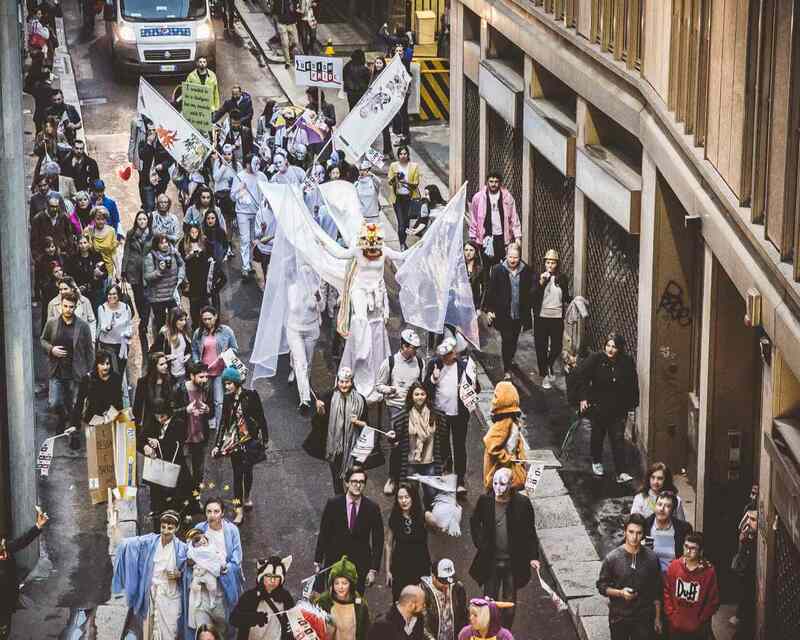 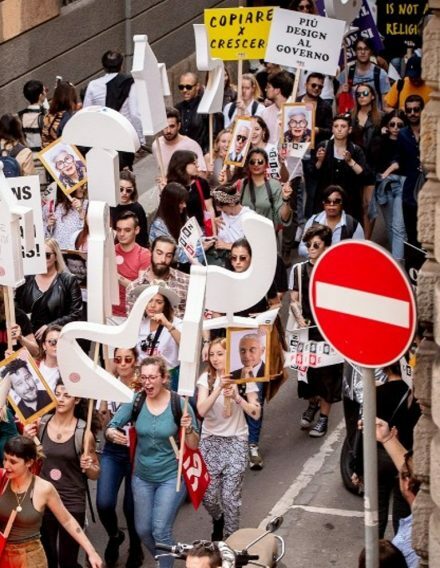 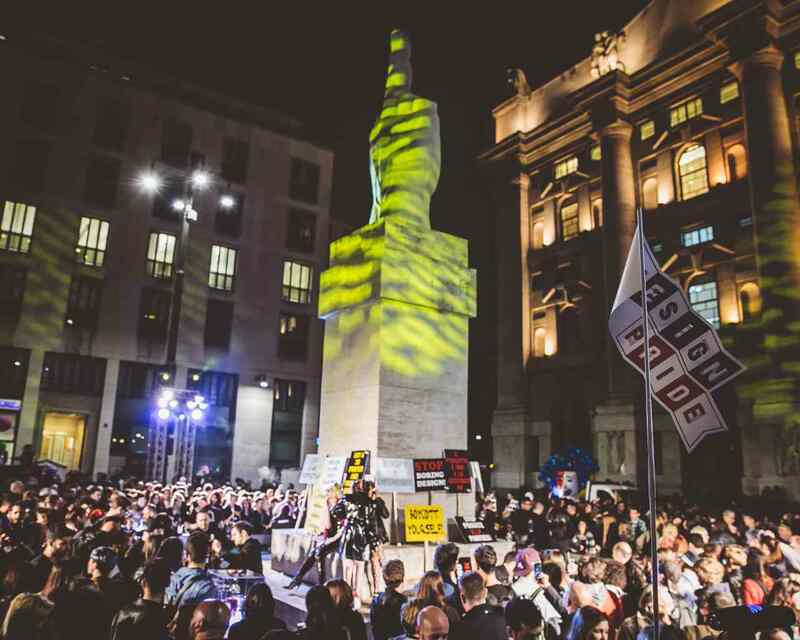 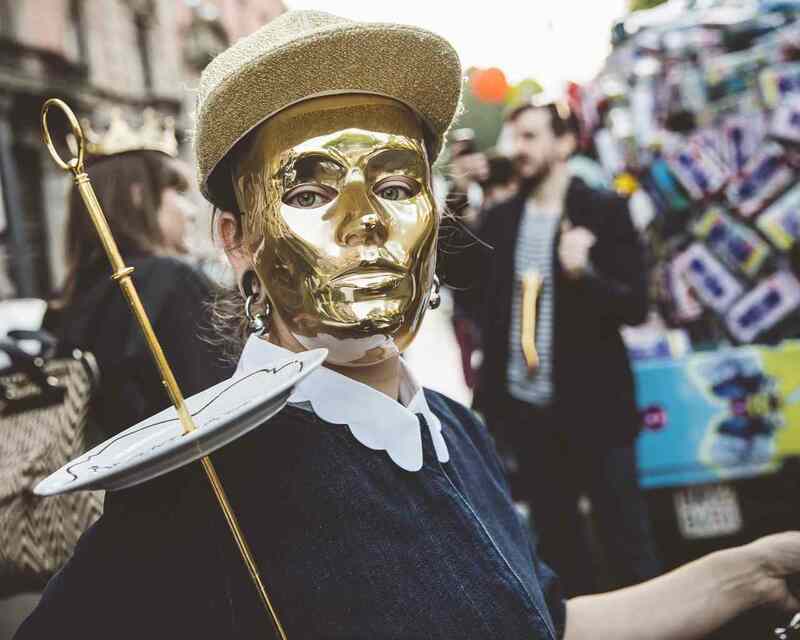 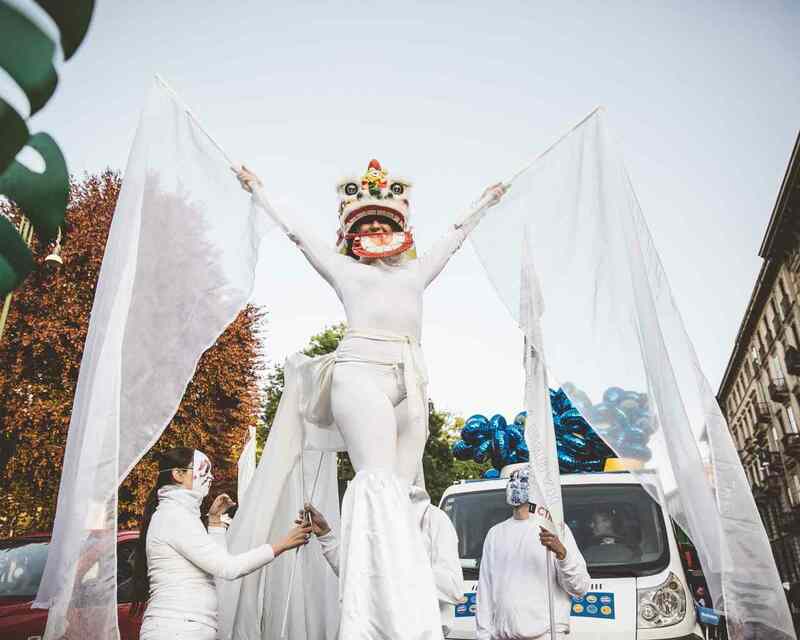 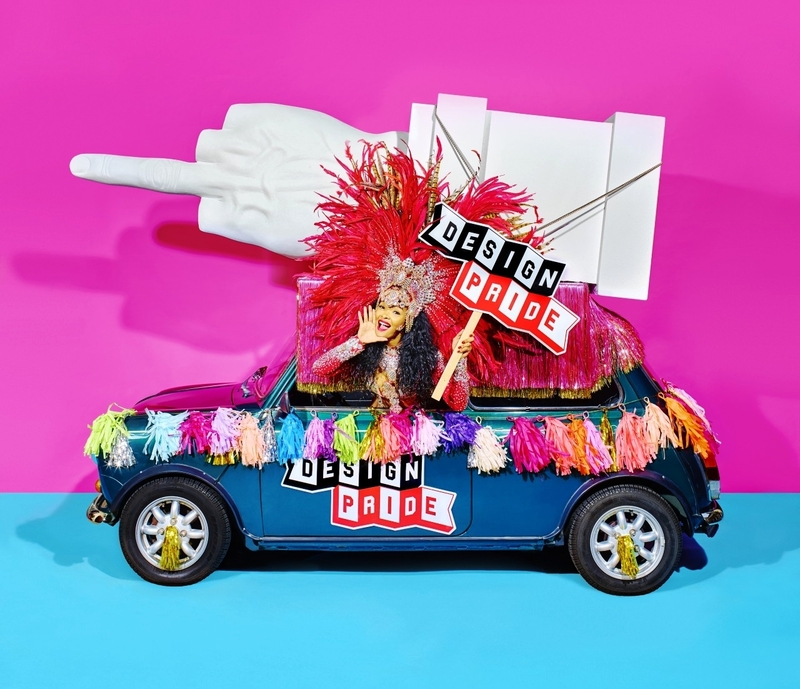 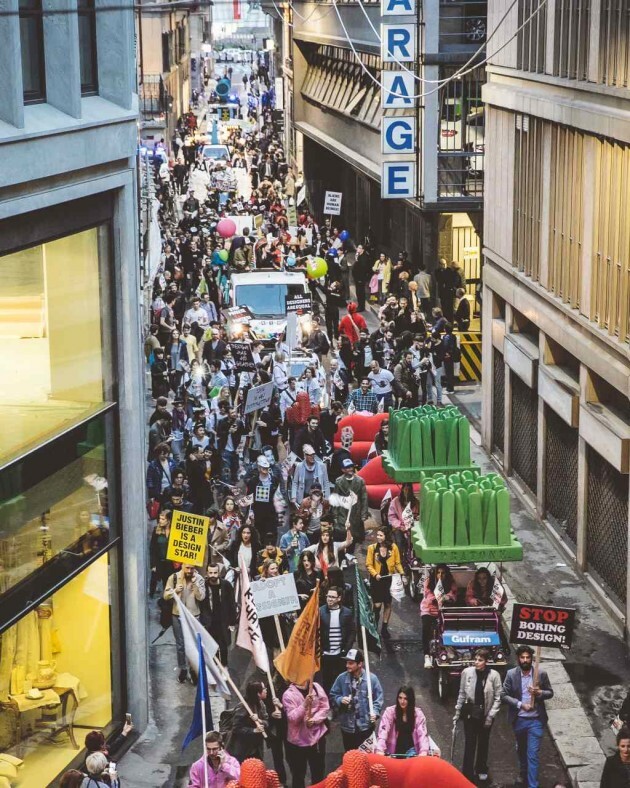 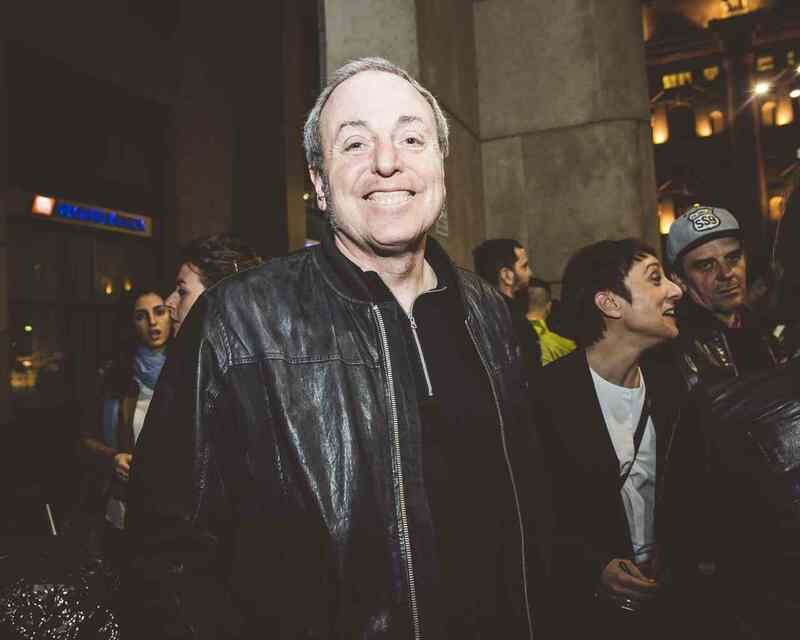 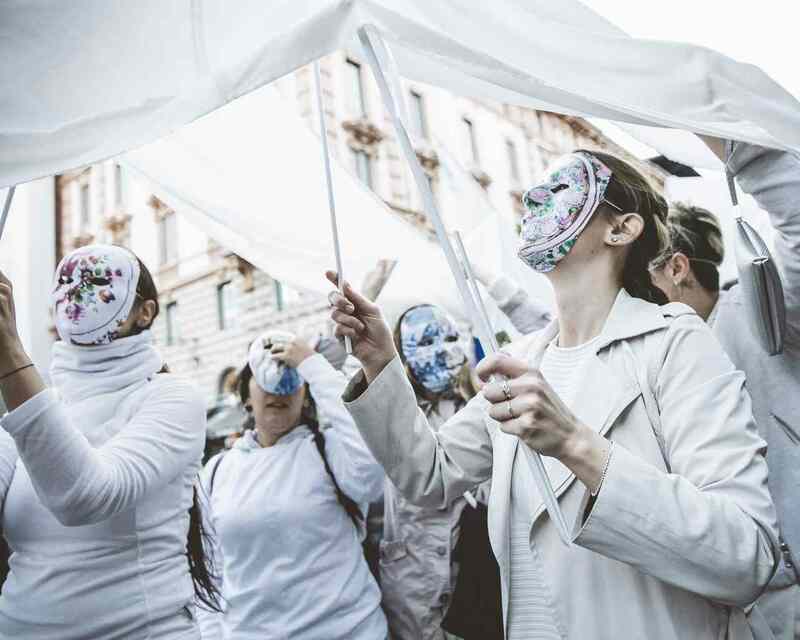 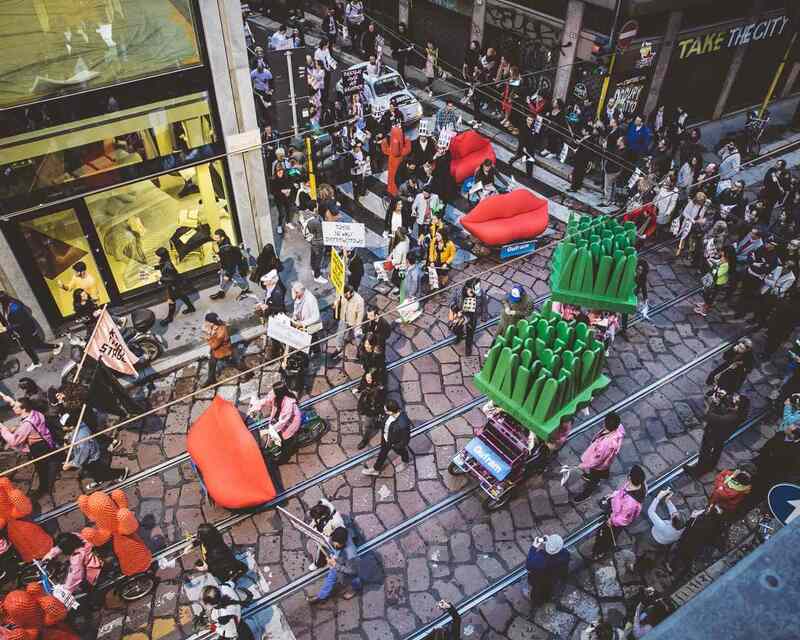 DESIGN PRIDE, the most democratic party of the Milan Design Week, peacefully paraded on Wed, April 13th, with a colourful procession of about 3,000 people who marched amongst a mixture of floats, banners, stilt walkers, music, flags and dances. 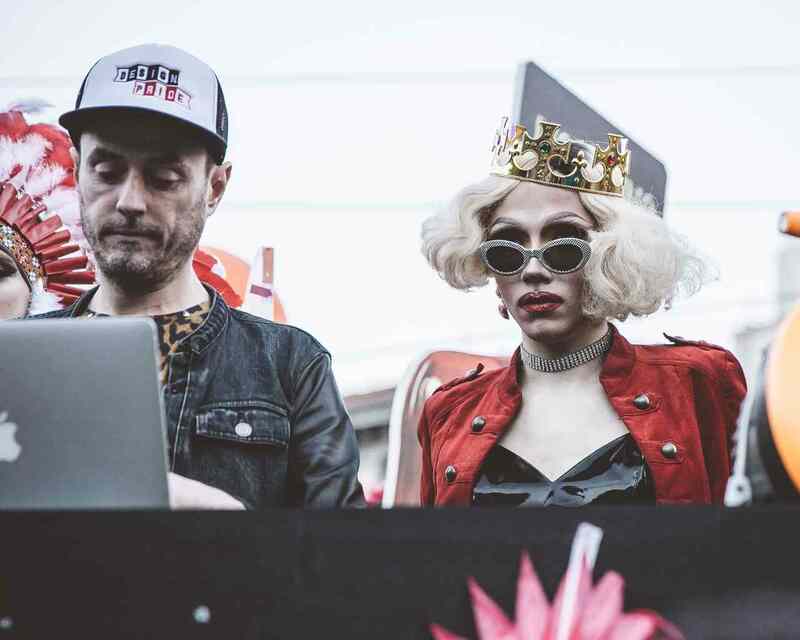 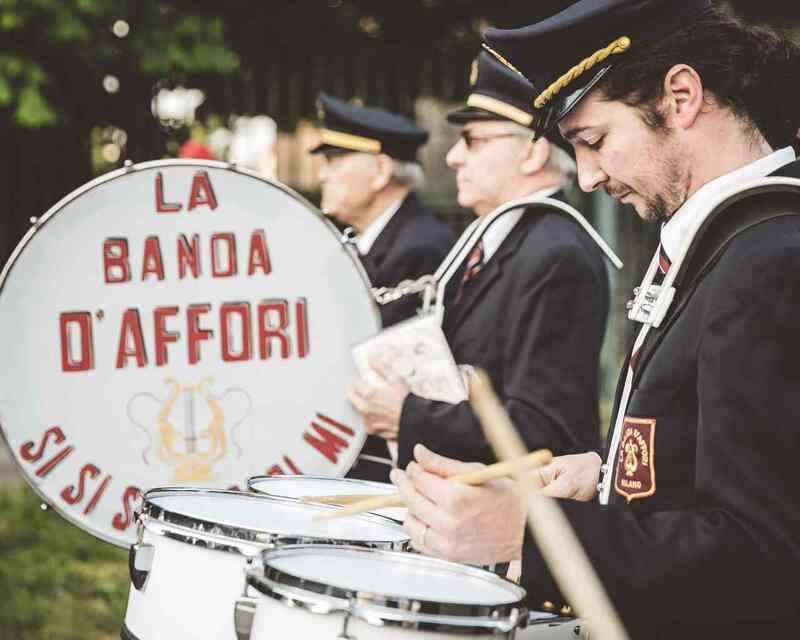 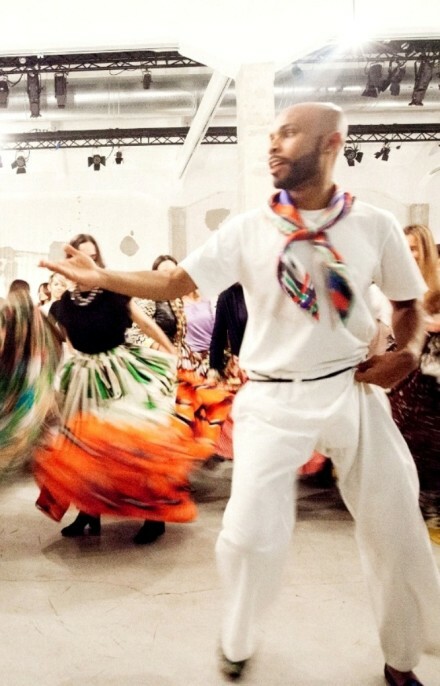 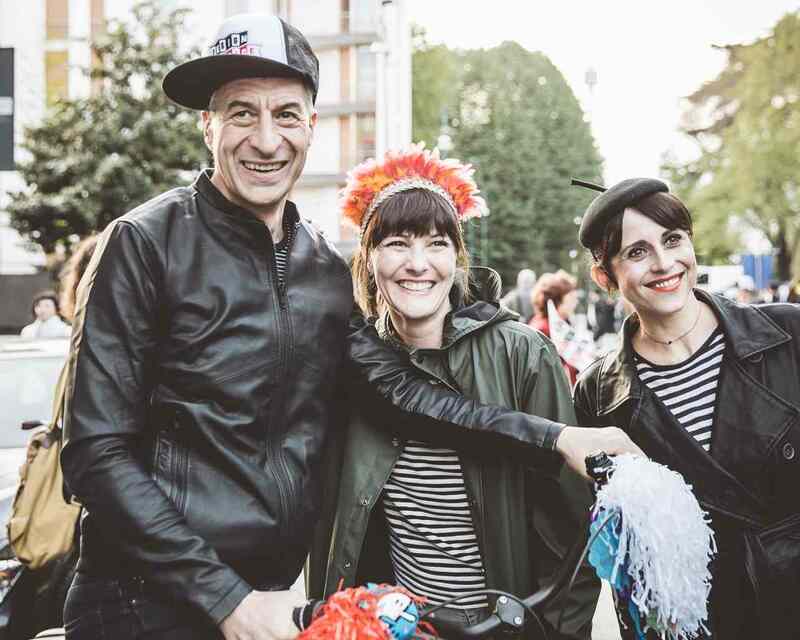 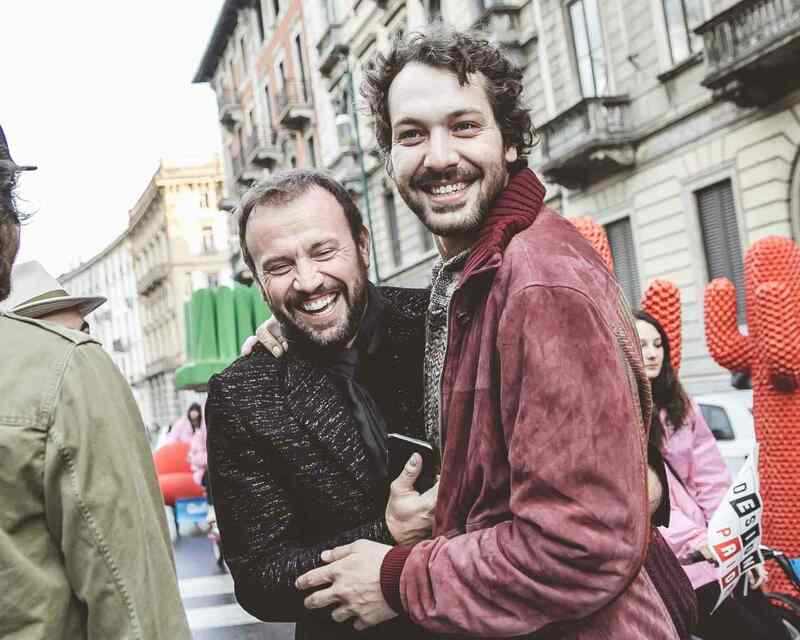 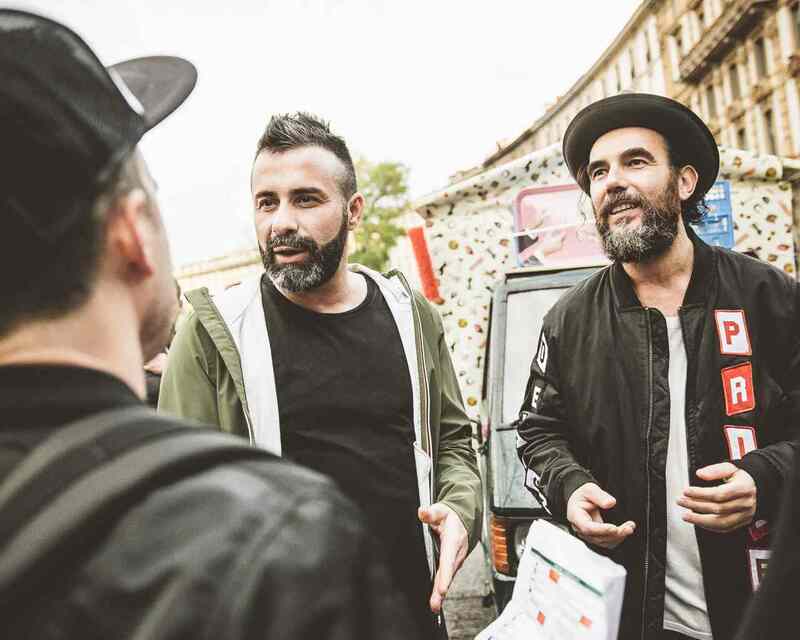 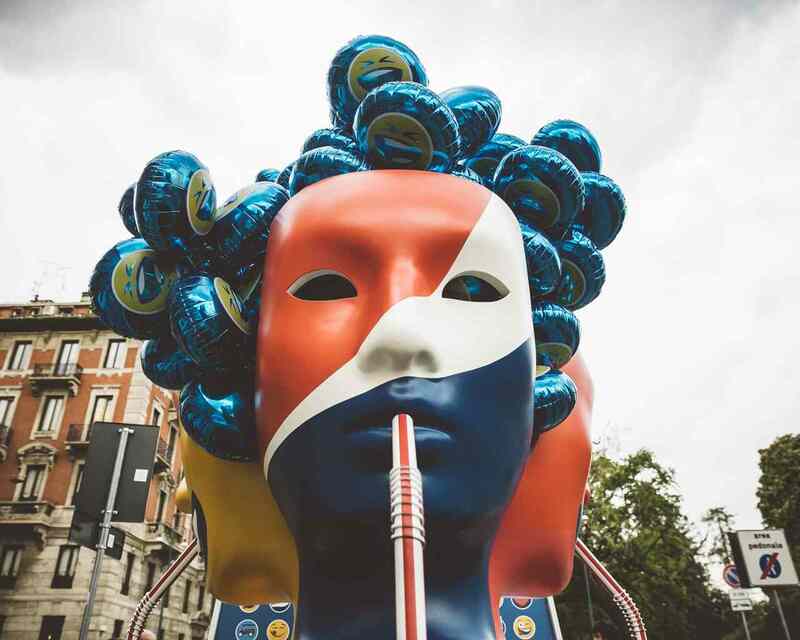 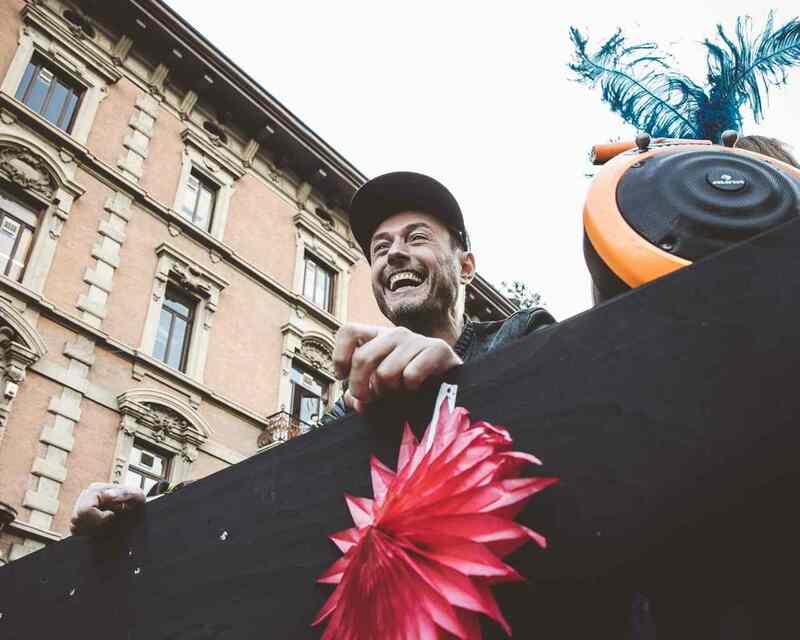 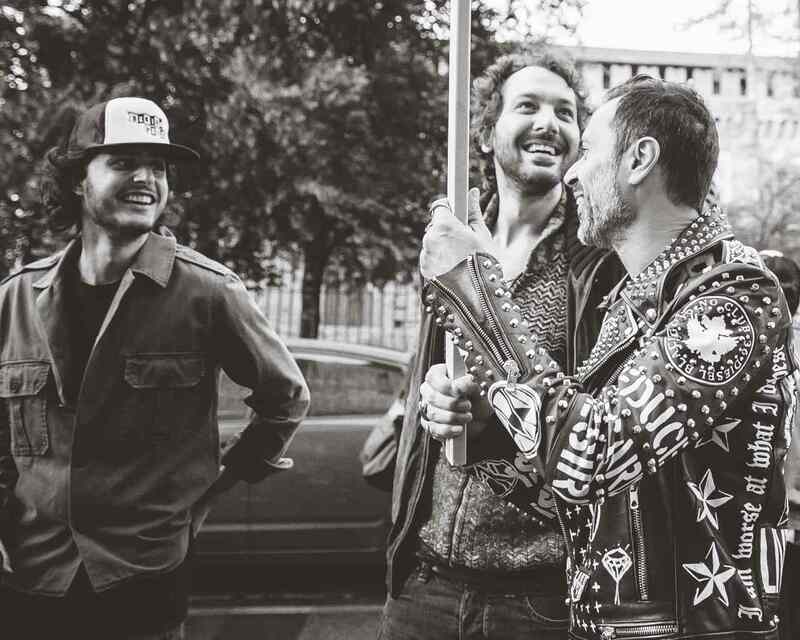 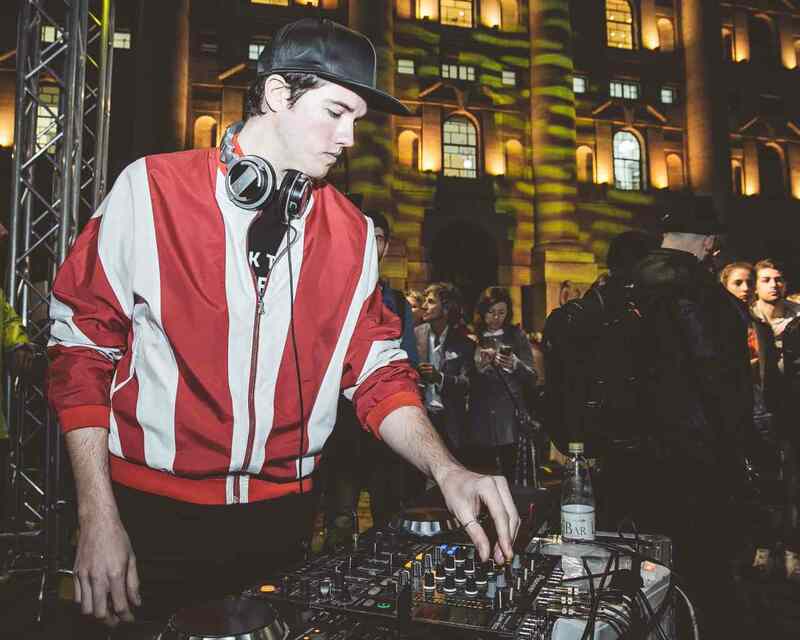 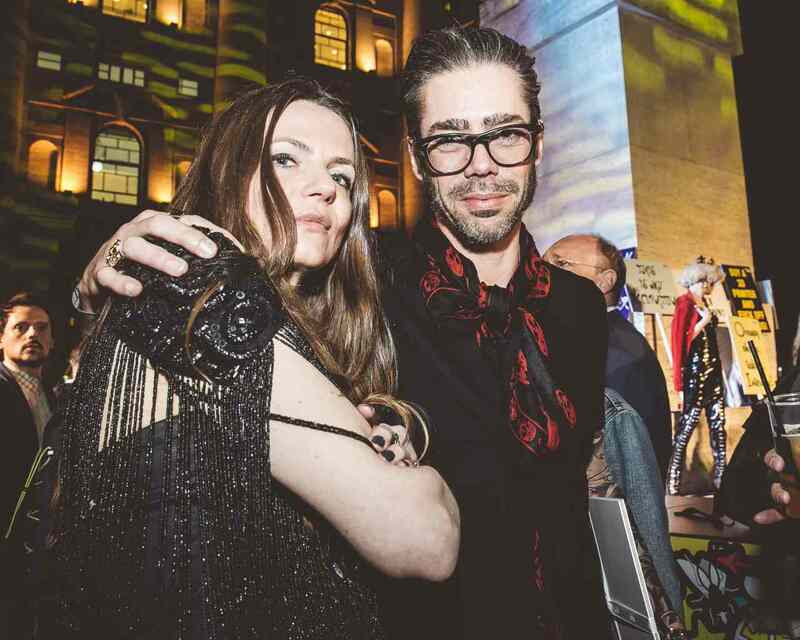 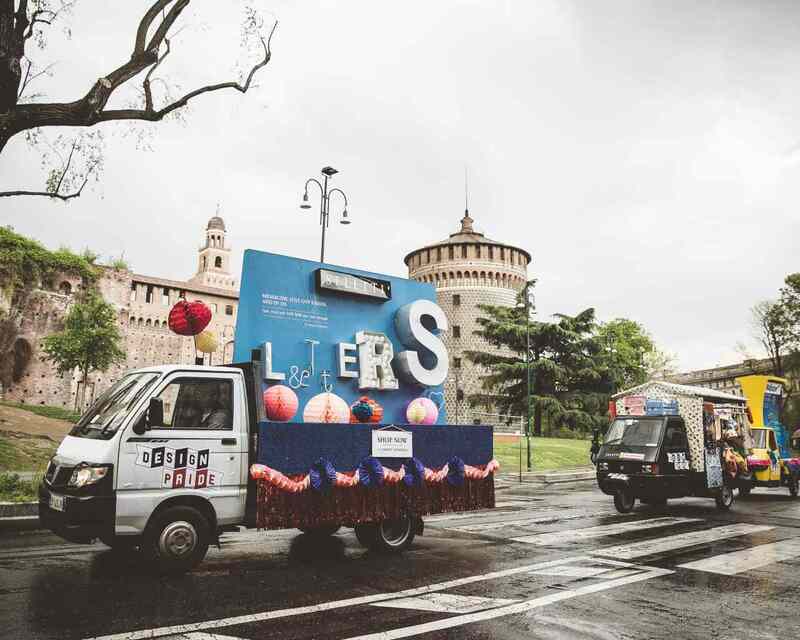 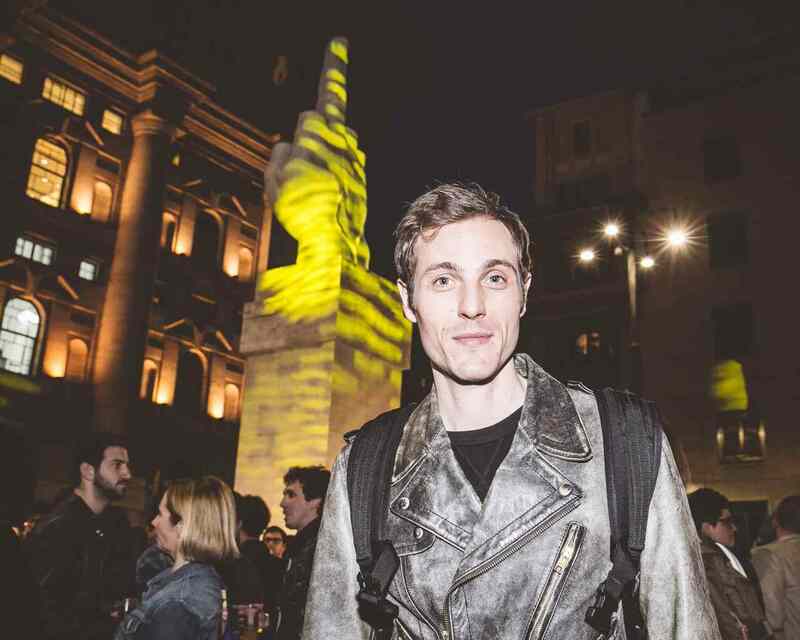 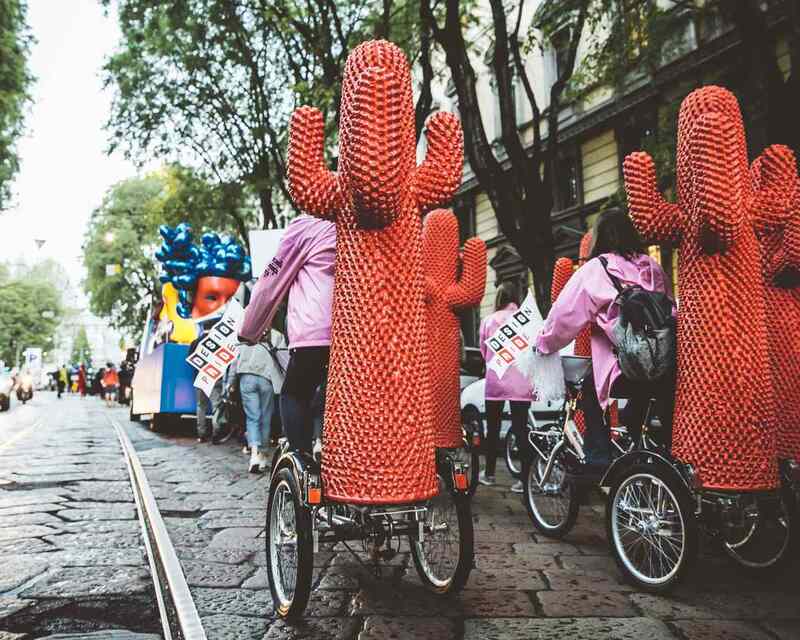 The parade, headed by Seletti, passed through the central streets of Milan and arrived in the 5 VIE district to culminate in a party organised in Piazza Affari by Disaronno. 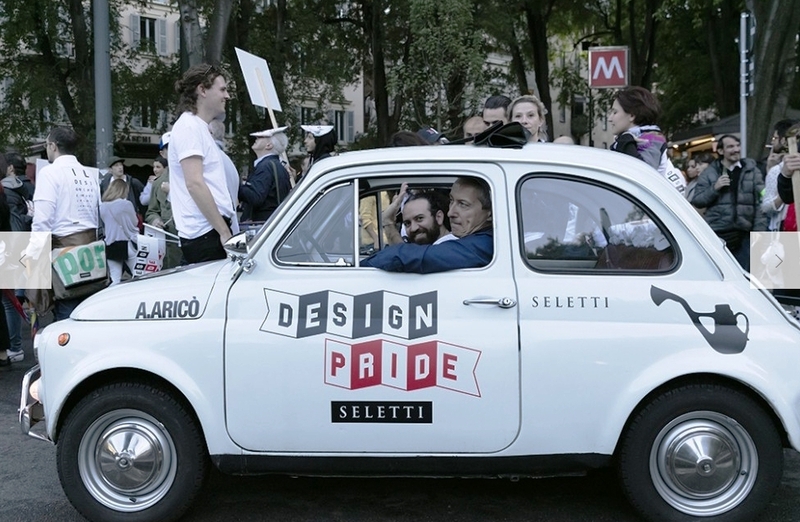 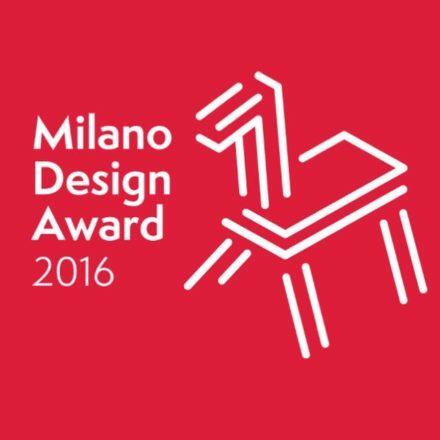 The DESIGN PRIDE project is part of 5 VIE art + design, sponsored by the City of Milan. 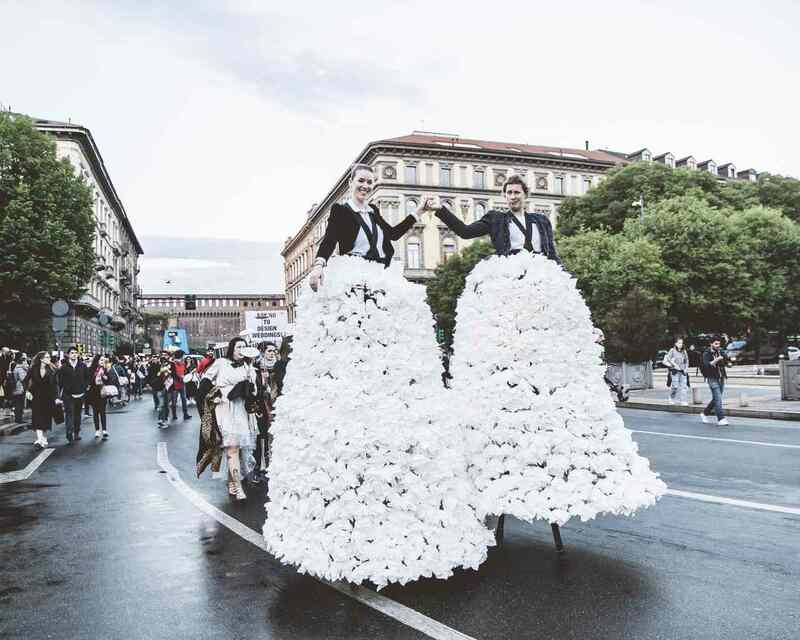 Toiletpaper magazine created by the Maurizio Cattelan and Pierpaolo Ferrari. 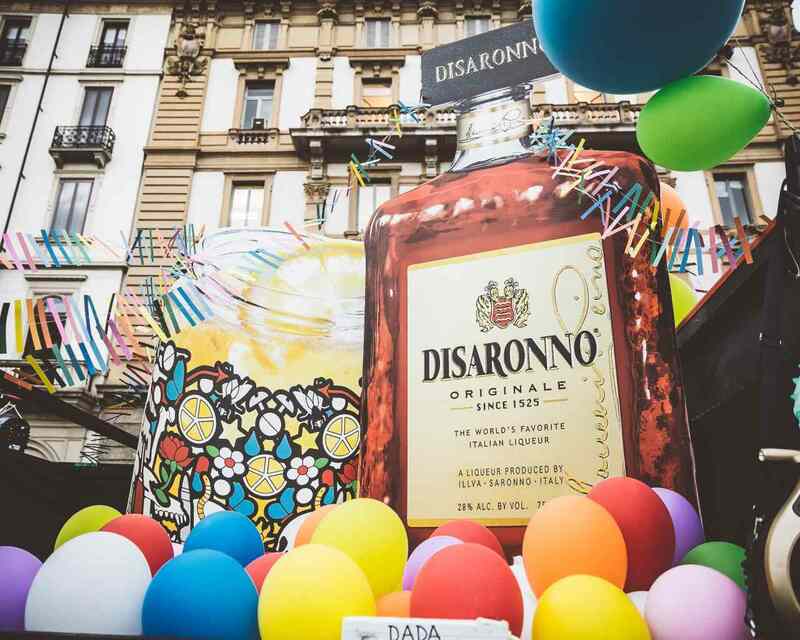 The parade departed from Piazzale Cadorna, travelled through the district of the 5 Vie and eventually arrived in Piazza Affari, where there will be party open to the public organised by Disaronno to celebrate the launch of their jar collection created in collaboration with Studio Job’s designers. 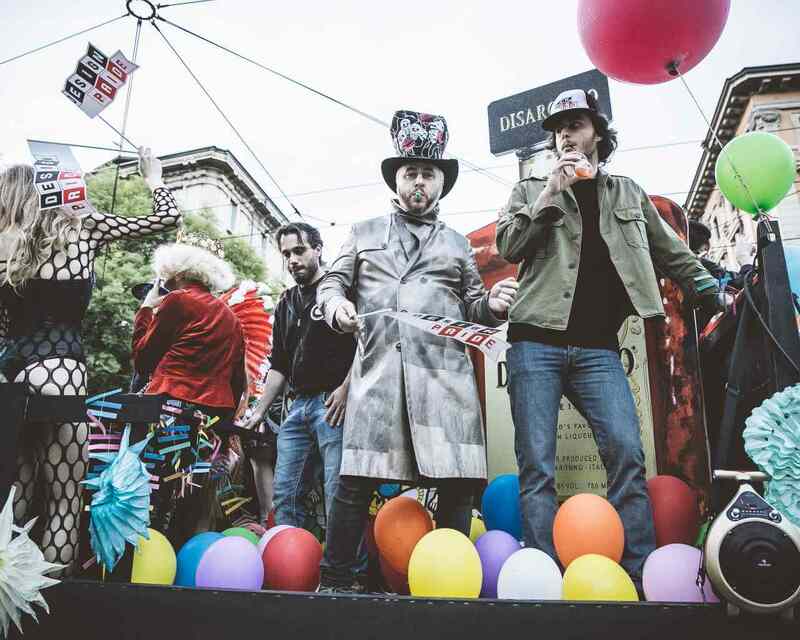 The parade started at startd at 7 pm from Piazzale Cadorna and finished with a big party at 8.30 in Piazza Affari (the home of the stock exchange in Milan). 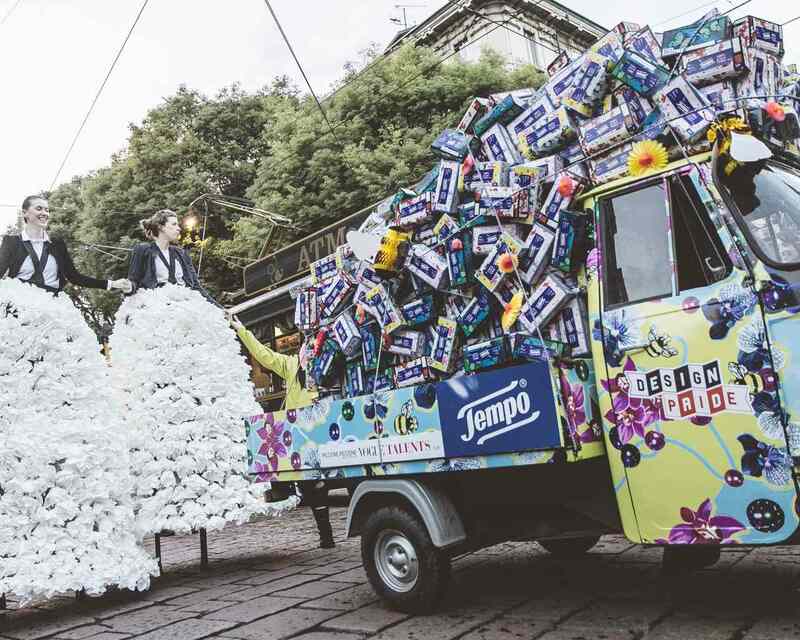 Tempo inspired Alessandro Zambelli to design an installation where two girls were walking on stilts wearing dreamy skirts made with the brand’s paper handkerchiefs. 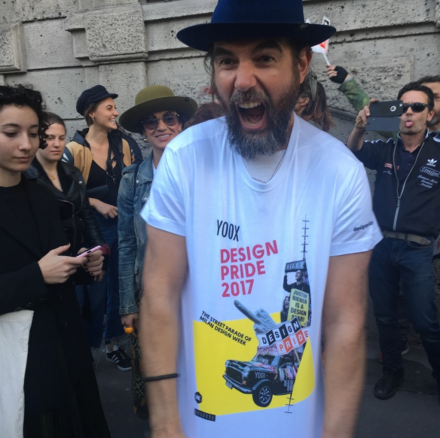 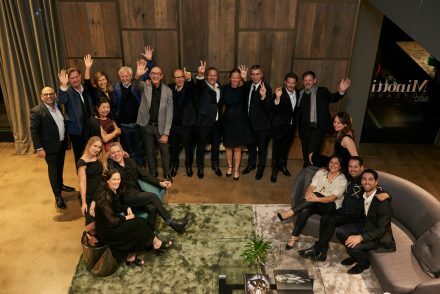 Many designers joined the DESIGN PRIDE: Amebe, Antonio Aricò, BBMDS, Valentina Carretta, Cristina Celestino, CTRLZAK, Umberto Dattola, Fabrica, H!FIVE, Ilaria Innocenti, Emanuele Magini, Piano B, Marcantonio Raimondi Malerba, Elena Salmistraro, Studio Badini, Studio Nichetto, Giò Tirotto, Sebastiano Tosi, Alessandro Zambelli, Zaven. 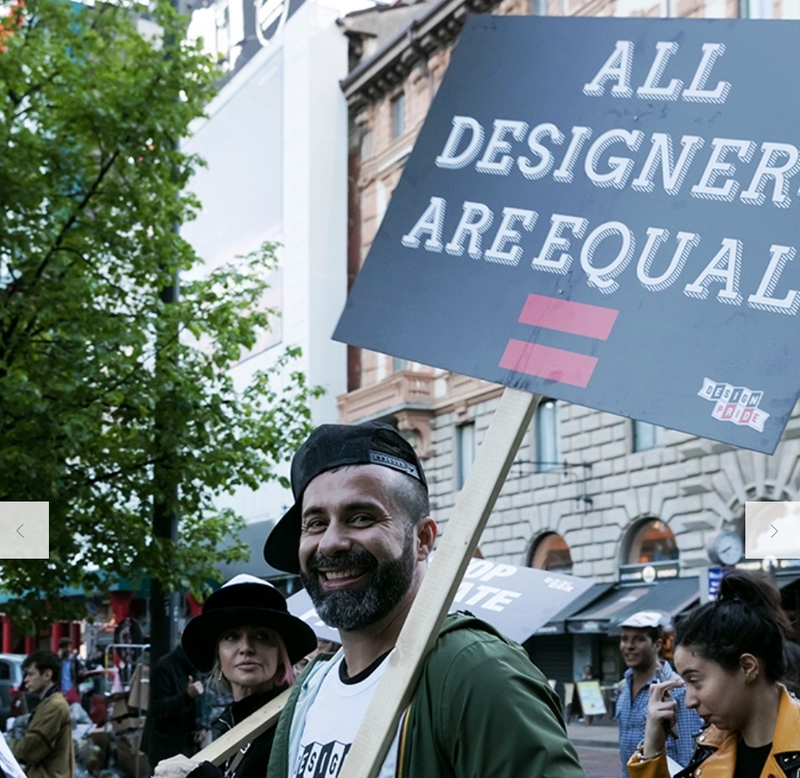 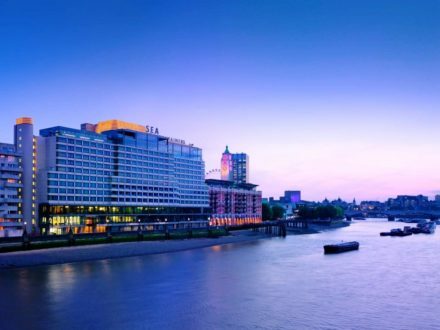 “We decided to organise the DESIGN PRIDE because design is democracy, liberty, joy and we wanted to celebrate it with a huge party to involve everyone, mixing the brands and the designer to the general public. 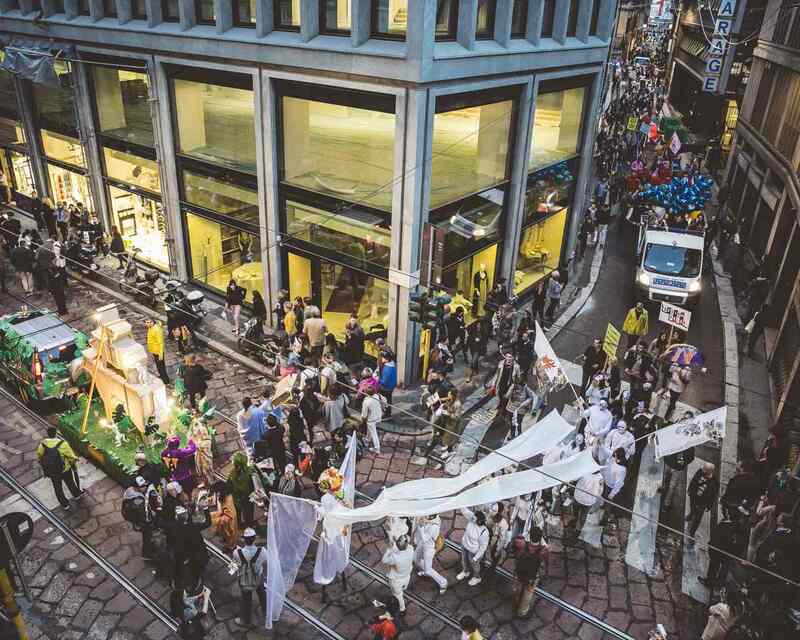 The greatest satisfaction was to see the the people passing by the streets joining the parade, children waving the flags, everyone dancing. 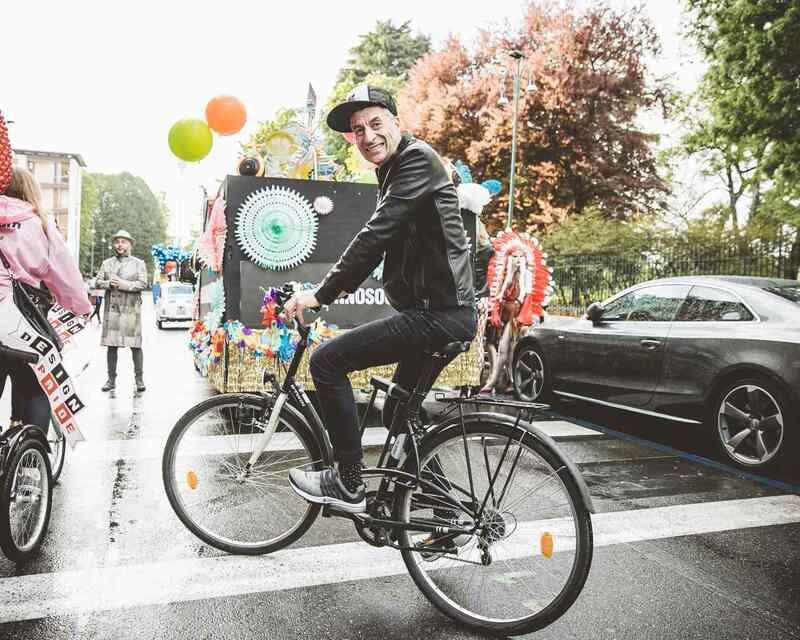 No even the rain has been able to stop us!”. 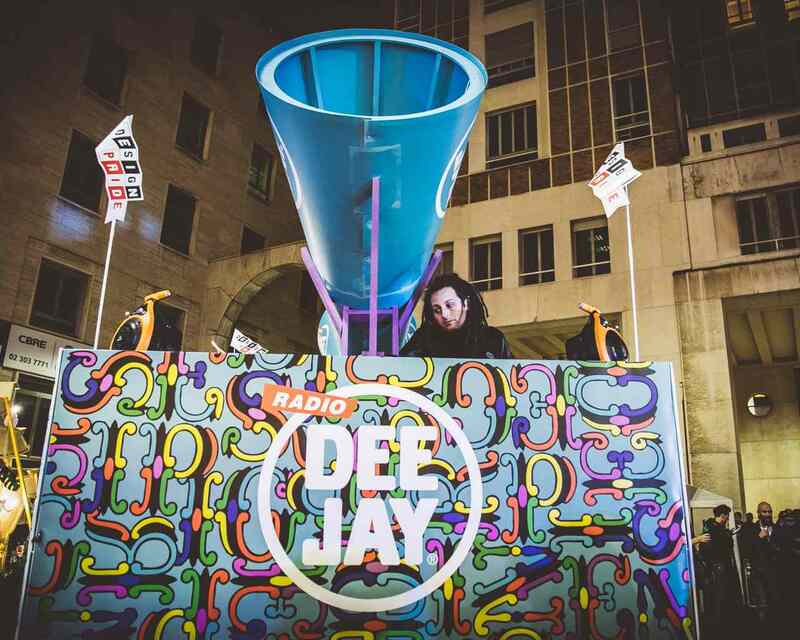 Lots of music in the colourful float signed by Radio Deejay, where DJ Shorty made everyone dance non-stop for the whole duration of the parade. 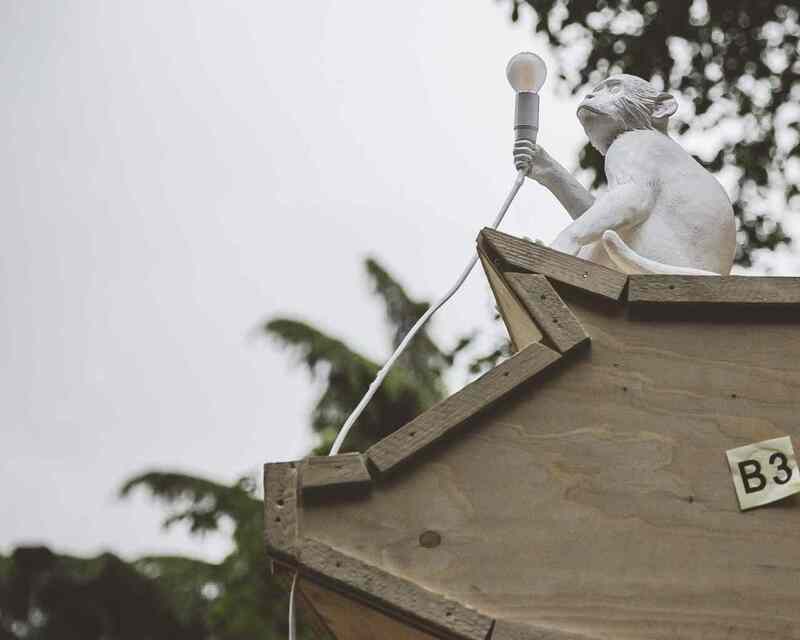 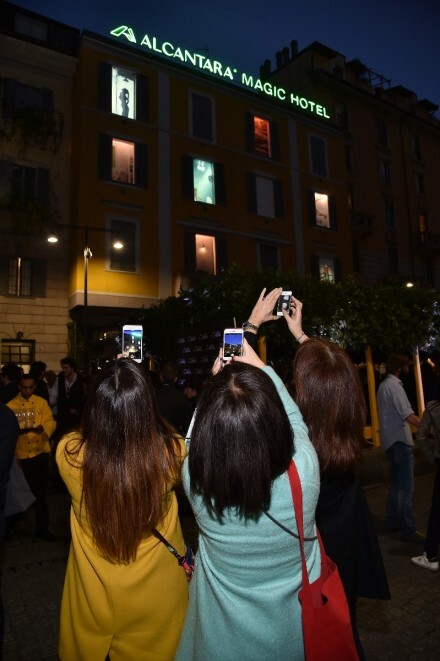 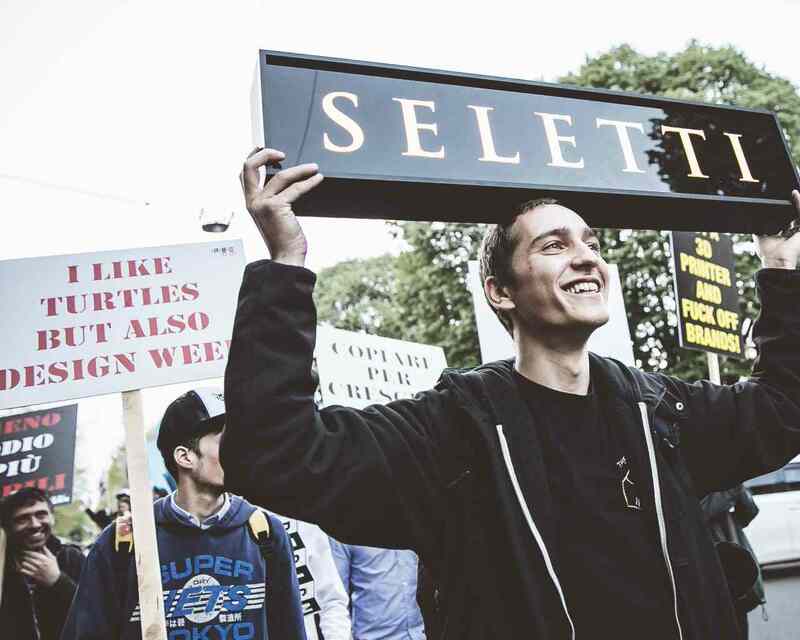 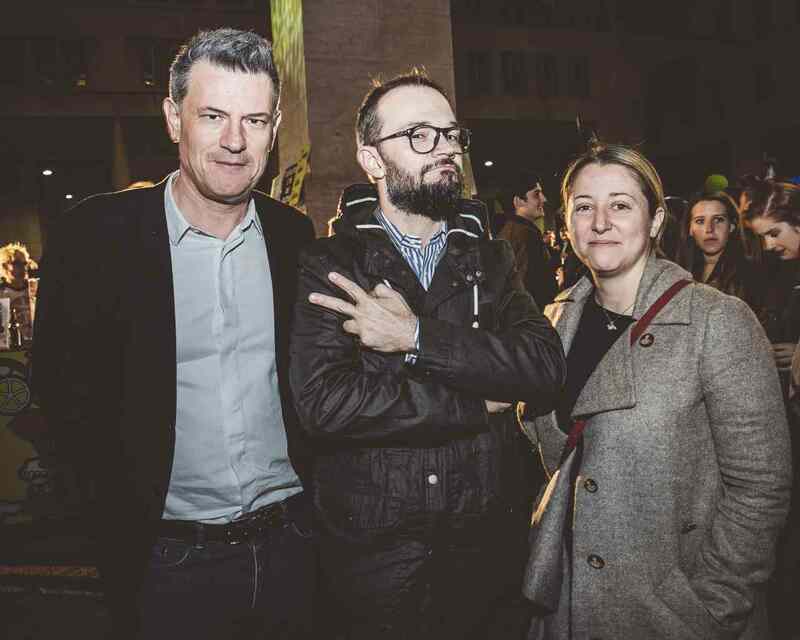 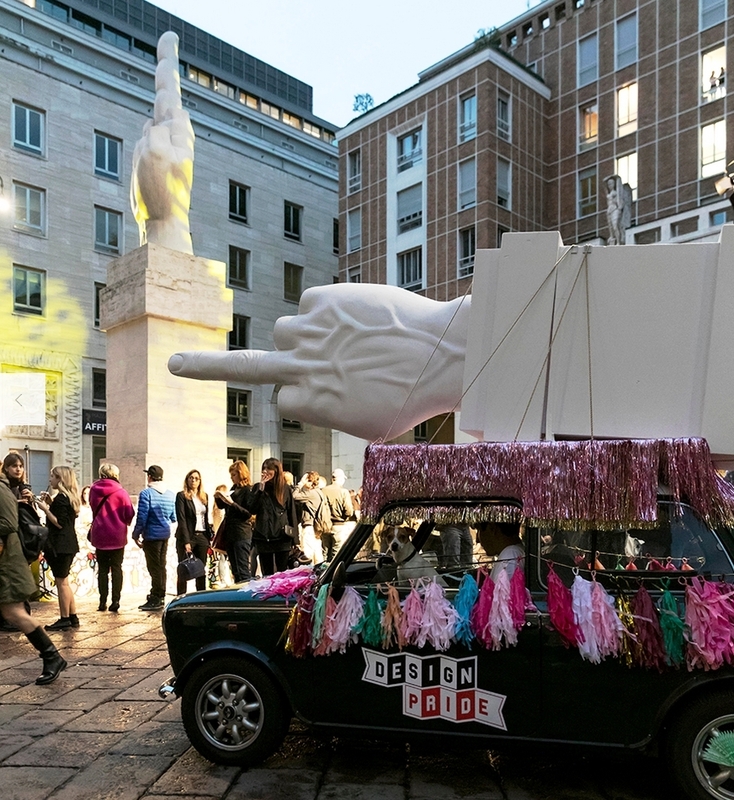 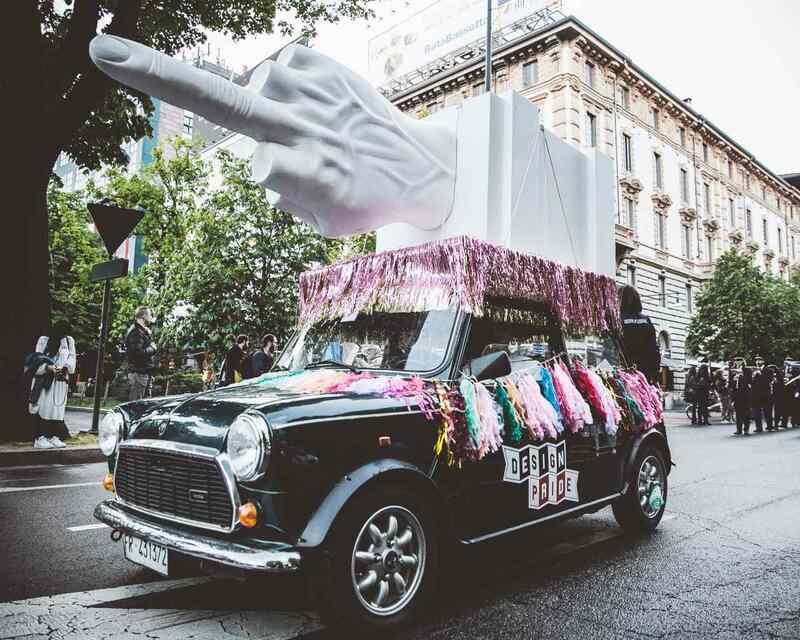 Seletti opened the parade celebrating Cattelan’s “middle finger” and presenting two floats dedicated to its best selling products: the alphabets – both lit and non lit – and the projects developed by Marcantonio Raimondi Malerba inspired by Nature. 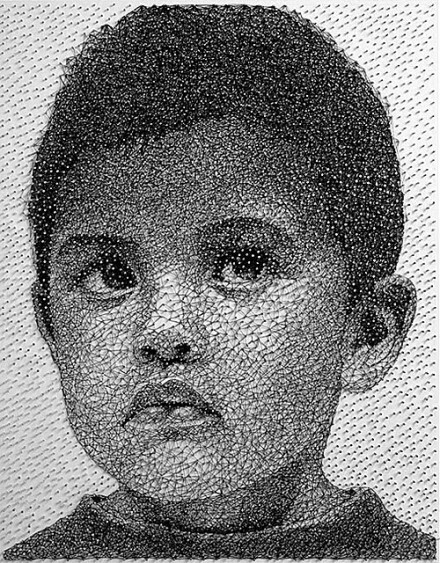 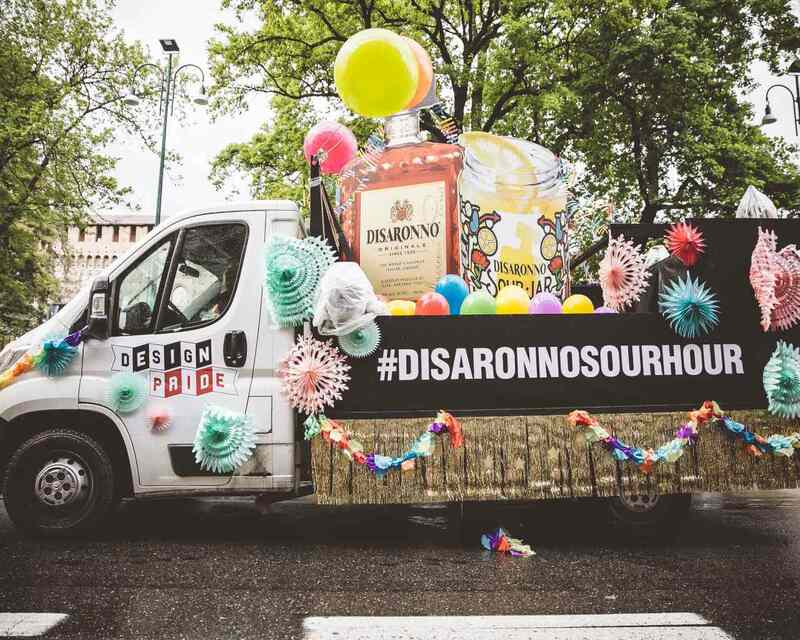 Disaronno participated with a float aiming to highlight the limited edition jar in 5.000 pieces created in collaboration with Studio Job. 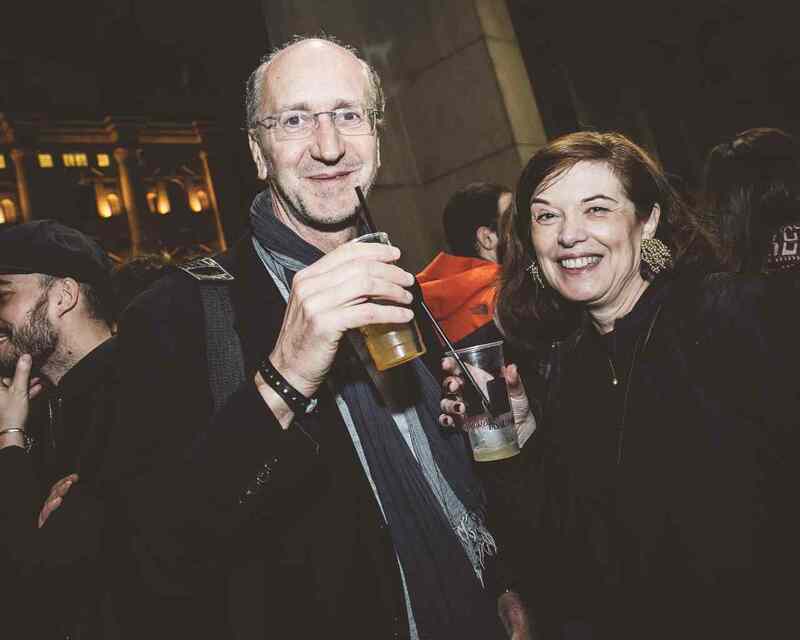 The jars were sold in Piazza Affari for 10 euros and the proceeds will be donate do Cesvi, a Charity overseeing international cooperation projects. 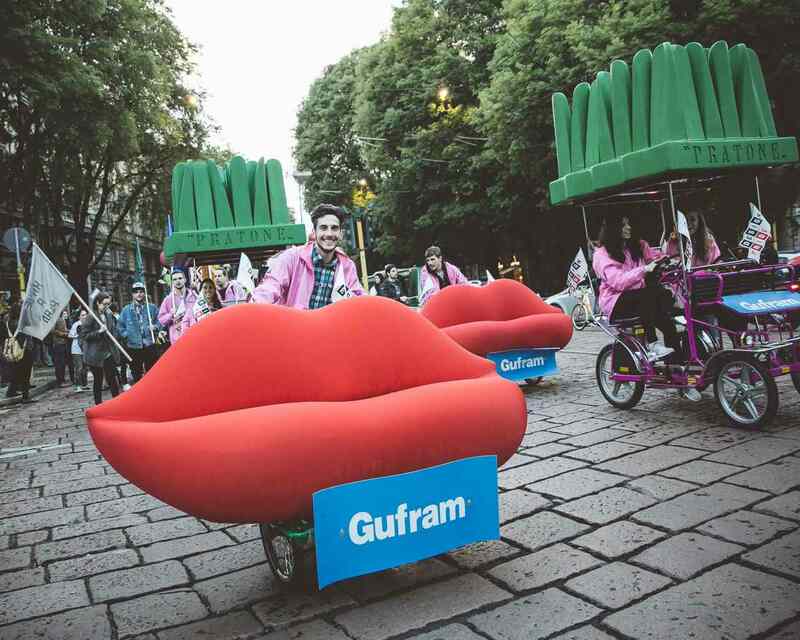 Gufram, the most ironic design brand, presented P.A.T.H.S. 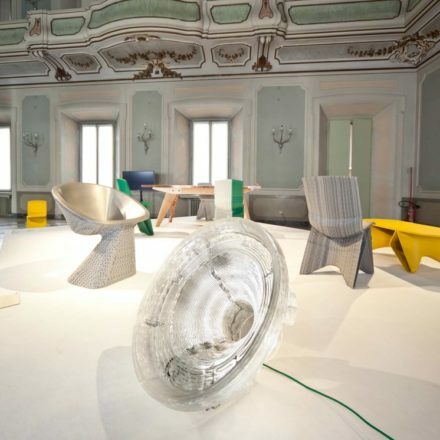 Pop Advanced Transportation Holystic System: a pop and alternative mobility system whose main characters were the most iconic pieces created by the company like the Cactus coathanger, the Bocca sofa and the Pratone seating system. 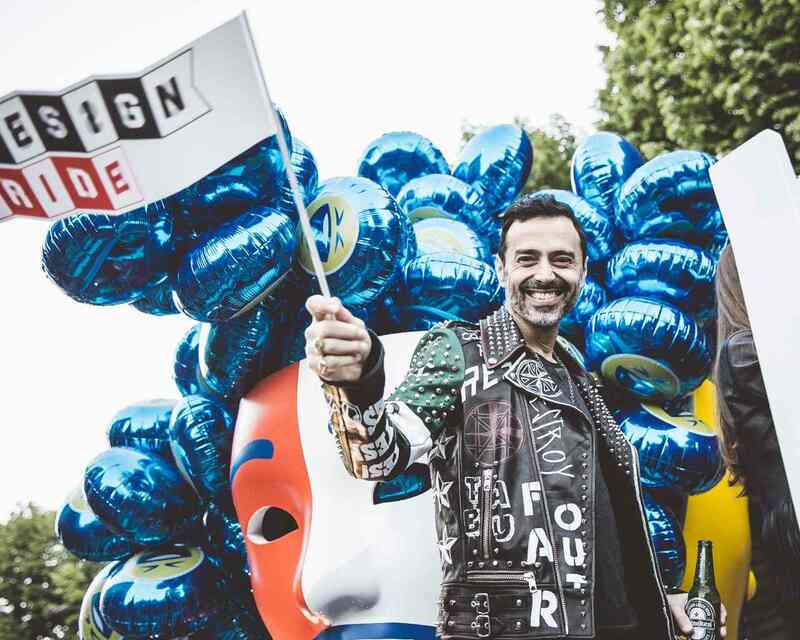 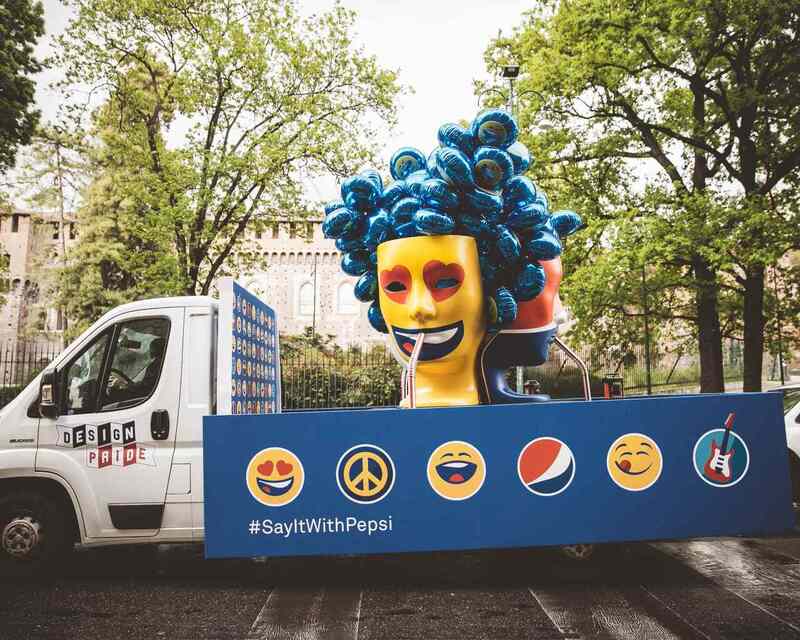 Pepsi teamed up with Fabio Novembre playing with the theme of the Emojis, on which the brand is building a new imaginary world.